If you’re looking for new, cool blues give Tim Gartland’s new album a spin. Tim Gartland had me hooked within the first minute of the lead track on his latest album. The lyrics to the chorus are simply: “I’m a party of one… but I’m drinking for two.” That pretty much sets the tone for this rollicking 10-song LP of new originals. “Satisfied” was recorded in Franklin, Tennessee, at The Rock House, produced by Kevin McKendree. The lineup is as follows: producer Kevin McKendree on keyboards (Delbert McClinton, Brian Setzer), Tom West on keyboards (Susan Tedeschi, Duke Robillard), Jack Bruno on drums (Tina Turner, Joe Cocker), Steve Mackey on bass (Delbert McClinton, Wallflowers), Robert Frahm on guitar (Blues Warriors), Tom Britt on guitar (Vince Gill, Jonell Mosser) and Memphis legend Wendy Moten on background vocals. 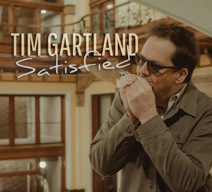 Gartland sings lead vocals and plays his trademark blues harp. Gartland moved to Chicago following college. After seeing Muddy Waters live, he decided to dive full force into blues. He studied with harp great Jerry Portnoy and was able to jam with Chicago legends such as Bo Diddley, Carey Bell, Big Jack Johnson and Pinetop Perkins. He now resides in Nashville. 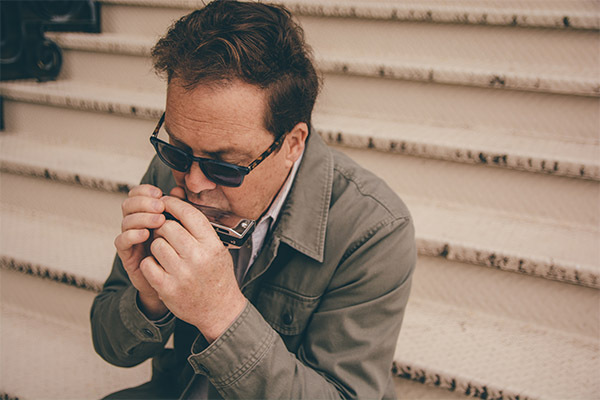 Gartland’s harmonica playing has been compared to Charlie Musselwhite on a few occasions, and after hearing the first few hot licks, the comparison is not a reach. Gartland can rip. He could hang at any all-star blues jam in a smoky club, and apparently can drink for two in the back alley. Back to the record. Gartland’s got a charm with his songwriting. He’s not trying to be too esoteric. He makes a point, and he makes it well. Gartland’s taking the blues, and he’s throwing strikes with it. There’s something to be said for that. Good grooves, solid guitar solos, catchy choruses, some humor in the lyrics, great harp playing, good production. Sign me up. “Drinking For Two” is a classic, catchy barnburner, that you could hear any band playing in any blues club in America. Hell, maybe the band I’m in will start playing it. “Don’t Make More Trouble” has solid advice in its message that we can all relate to. “Can’t Paint A Prettier Picture” reminds me a lot of Chuck Berry’s “Carol” in a great way, and “Don’t Judge Me” has a killer harmonica and guitar duel. The songs are solid, there’s not a clunker in the bunch, and once it’s over, you can’t help but feel like you had a really good time.